There's fights, car chases, explosions, girls and a corny plot that's paper thin with a twist that literally ridicules how dumb it thinks its own audience is. Anyone would think this is a Michael Bay film... but at least you can watch SOME of his films a second time. It does have some pretty good deaths, but on the whole it's as predictable as the Sun coming up in the morning. It's hard to believe they are still making more of these Death Race movies - with Death Race 4 due out later this year, it's a wonder they haven't killed off their audience by now. I can't say I'm looking forward to seeing any more of these - I haven't even seen the two that followed this one, despite the fact they somehow managed to attract stars like Sean Bean, Ving Rhames, Danny Trejo and Dougray Scott. Anyway, for some of you, Death Race is still worth a watch if you're happy to leave your brain at the door and just sit back and enjoy the ridiculousness of it all. There might be some entertainment to be had here while it lasts for some people. 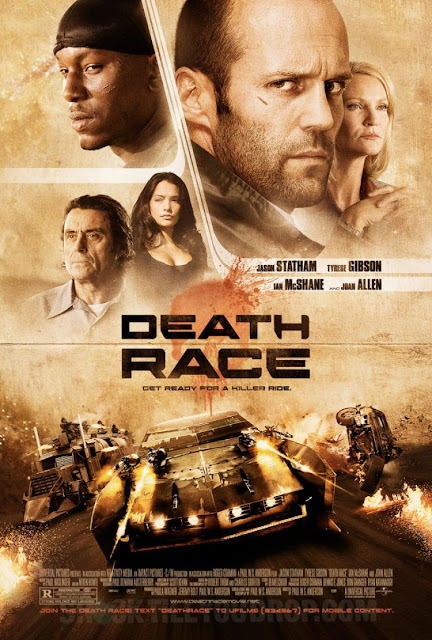 What did you think of Death Race? Is it worth watching any of the sequels? About the Author: Chris Russell loves movies, films and cool TV shows and loves to share that passion here on Movie Retrospect where readers can join the discussion in the comments below or directly to Chris though his Google+ profile. If you enjoyed this post, please follow @MovieRetrospect on Twitter.